The four hundred marks reproduced in this book represent the diverse array of identity work produced by Pentagram's partners, past and present, since the company was founded in 1972. Over the past four decades, Pentagram has designed marks for large corporations and small businesses, government agencies and non-profit institutions, clubs and societies, and even individuals, all of whom were seeking a representative symbol to appear on letterhead and books, buildings and websites, and everywhere else imaginable. Previously only distributed in a limited edition, this invaluable book is now made available in a paperback version and will provide inspiration for all graphic designers working on identity projects. 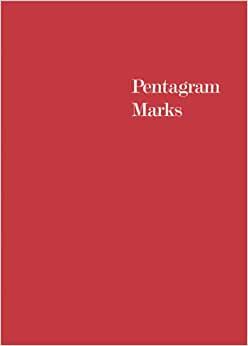 Pentagram originated in London in 1972 and opened offices in New York in 1978, San Francisco in 1986, Austin in 1994 and Berlin in 2002. It provides design services across the full spectrum of graphics, identity, architecture, interiors, and products to both local and international clients. Pentagram is one of THE best studios in the country and the world; this is a showcase of (all?) their logo work. Classy presentation by showing all logos in black. While some logos are unremarkable, there are plenty of amazing works and some not as common. A definite go-to resource for logo designers. This needs to be on your shelf. 5.0 颗星，最多 5 颗星Another excellent book from Pentagram. Yet another excellent book, this their 8th, from the design firm of Pentagram. The book is clean and most concise. Right on the "mark"! You're out of luck if you missed purchasing this limited edition by Pentagram. I wished I ordered more than one.